He thinks mischief but The Good Lord works it for our good. the more speedily our miracles are manifested because of our love for our Saviour Jesus Christ. the quicker God grew him to become a deliverer of Israel through Christ. the quicker their salvation. Egyptians sped quickly into self destruction. The fear of The Lord is the epiphany of wisdom. But Pharoah never knew the mystery of Our God. trust in the invisible, invincible God who created you, I and even the devil himself. Every calamity is an opportunity for God to perform eternal miracles. Joseph will not value kingdom rulership without his past. He will not value liberty had he not been imprisoned. He will not have valued his wife had he not encountered Potiphar’s wife. But the good news is even at the most bottom of your life will give you a reminder of how you are going to value the topmost of your life. Faith works with Love and Faith is tried through patience. Patience is not giving up but action that meets the manifestation of our miracles. You might be known now but your not being known is going to be the reason why others will be known. Potiphar will never have appeared in The Bible had it not been for the unknown Joseph. Just imagine even as a slave we knew his name as Joseph. Can you please tell me the name of Potiphar’s wife. There is no Potiphar without Joseph. You are greater than great. Every calamity is calling for a testimony through Christ Jesus. 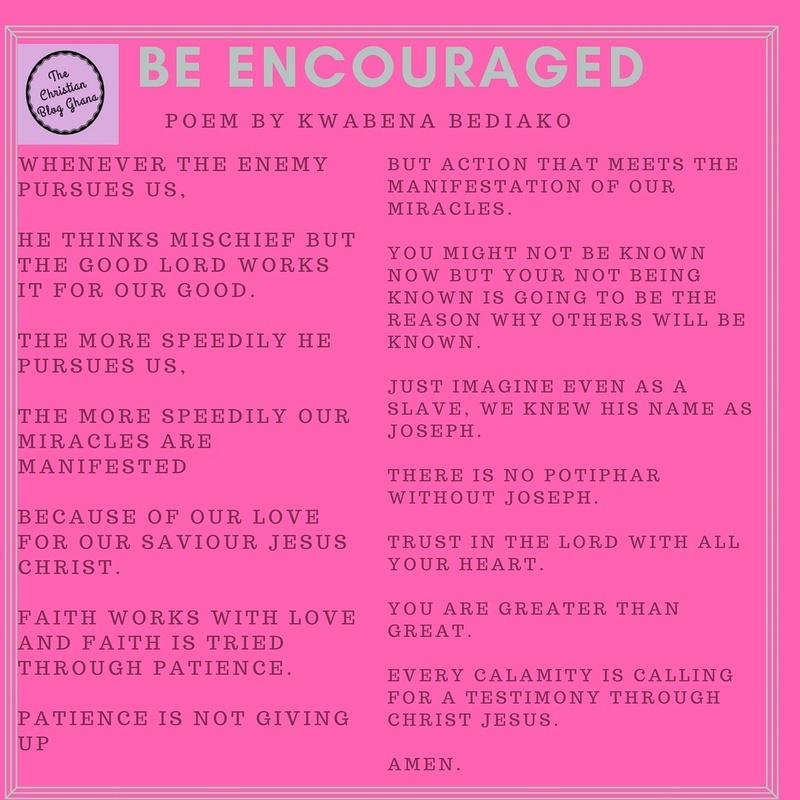 Author The Christian Blog GhanaPosted on June 6, 2017 August 16, 2018 Categories Guest BlogTags Christianity, Encouragement, Faith, Jesus Christ, Kwabena BediakoLeave a comment on Be Encouraged!